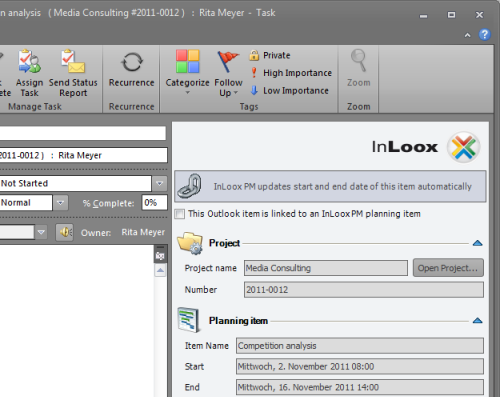 InLoox PM 7 enables you to link Outlook tasks and appointments - by using quick access panels. InLoox PM 7 synchronizes all information automatically. Calendar items can be connected with milestones and activities in the InLoox PM project planning. You don't even have to open a project to gain real-time information about the respective project. Project planning changes, e.g. appointment changes, are automatically synchronized. Open the respective project by clicking Projects in the Outlook Ribbon. Now select the respective project from the project list and open it by double-clicking it. In Outlook 2003/2007, click the InLoox PM Folder in the InLoox PM Toolbar. Then double-click the respective project in the project list. Click the planning element that is supposed to be synchronized. On the Edit tab, in the Actions group, click Synchronize (With Outlook Task, With Outlook Calendar). A new Outlook element will be created in the Outlook task list or the Outlook calendar. Click the InLoox PM tab and then Show Workpackage List in the Extras group. In Outlook 2003/2010, the workpackage list is displayed automatically in the Outlook calendar and task list, as soon as you have been added as a resource to the respective workpackage. Select the workpackage on the workpackage list that is supposed to be synchronized. Select Synchronize (With Outlook Task, With Outlook Calendar). Activate this check box if you want to keep the start and end date of this Outlook element synchronized with the start and end date of the InLoox PM planning element. Name of the InLoox PM planning element. Start of the InLoox PM planning element. End of the InLoox PM planning element. Description of the InLoox PM planning element. A team member that is assigned to this work package. Shows you, whether the particular resource has completed his/her task. Start and end date that have been changed from synchronized Outlook elements will be overwritten if the project plan is changed. The user no longer has to move a synchronized Outlook element. How to add task and calender to the quick access panel | InLoox PM 7 • Copyright 1999-2019 © InLoox, Inc. All rights reserved.